That’s how many times the Detroit Lions have been victorious when playing their annual contest in the state of Wisconsin. The one victory was in 2015, and it took a duck hook FG by Mason Crosby at the end of regulation to win by two. 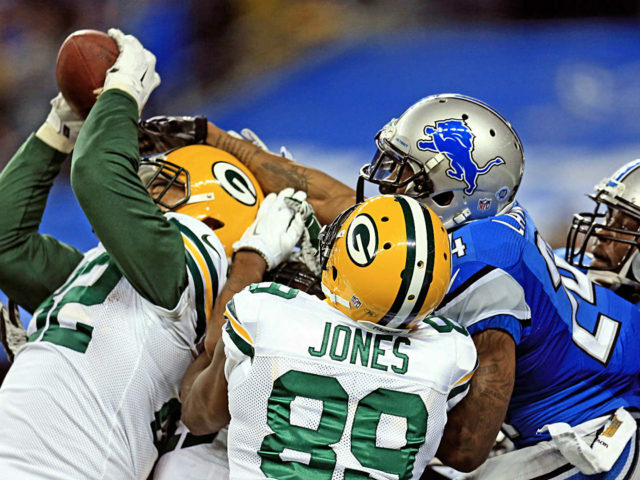 Going into tonight’s game, the Detroit Lions are favored to beat the Green Bay Packers at a venue where they have converted in one of their last 25 attempts. Oh, and they’re also riding a three game losing streak. And yet, they are still favorites. Vegas could come away a big winner in the financial column with a Lions victory. There’s only other party that could stand to gain more financially from a Lions victory. That would be a one man party listed on a game program by the title of Rodgers, Aaron. Packers: Aaron, what do you feel is your value to the organization? Rodgers: Well, on my very worst day, I’m the second best quarterback in the universe. On most days, you could make the argument I’m the best. There’s a guy in Detroit, who many would argue isn’t even a top 10 QB, that’s hauling in more cash than me. That doesn’t make much sense, does it now? Packers: We understand where you’re coming from, Aaron. While everyone in the room knows that you’re going to leave this room with a fortune, we have to run a team. A competitive team. We can’t give the whole farm to you. Rodgers: Vegas just predicted that a reeling Lions team, who have been one of the crappiest teams in America for the better part of a century, would beat you. And they did. There are only a few givens in life. Those would be death, taxes, and the Lions losing in Wisconsin. Well, the Lions just won in Wisconsin, and it’s because I wasn’t there. Here’s the routing number and account number to my bank. Take what Stafford makes and add $4 million a year on top of that. Everyone knows it’s the best investment you can make. Now, I’m going to swing some sticks at Whistling Straits. I look forward to my family hearing about my latest deal in the news. Or, Rodgers could simply print and laminate the game lines for tonight’s game and throw that on the negotiating table without saying a word, and walk out. That method would still pay him handsomely. This entry was posted in Packers 2017-2018 Season, Uncategorized and tagged Aaron Rodgers, Detroit Lions, Green Bay Packers, Packers, Vegas Super Bowl Odds. Bookmark the permalink.